Did you know that the Area Agency on Aging District 7 (AAA7) can provide support and assistance for grandparents who are raising their grandchildren? As a part of the AAA7’s Caregiver Support Program, assistance is provided to grandparents through training, information, and counseling. Supplemental purchases for a service or product to complement the care provided is also an option based on funding availability. Grandparents who are age 55 or older and caring for someone age 18 years of age or younger can call our agency at 1-800-582-7277 to find out more about what assistance is available that can support you. As back-to-school time is upon us, some supplemental assistance could include school clothing and school fees based on eligibility and available funding. Safety is another priority that families think about as children return to classrooms. It’s important for parents and grandparents to remind children about proper safety precautions. • Walk on the sidewalk, if one is available. When on a street with no sidewalk, walk facing the traffic. • Before you cross the street, stop and look all ways to see if cars are coming. • Never dart out in front of a parked car. • Practice walking to school with your child. • Make sure your child always wears his/her helmet when leaving the house. • Teach your children the rules of the road that they need to know for riding their bicycles. • Ride on the right side of the road and in a single file. • Come to a complete stop before crossing the street. 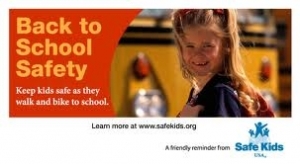 • Go to the bus stop with your child and teach them the proper way to get on and off the bus. • Make sure your children stand at least six feet away from the curb. • If you and your child need to cross the street in front of the bus, walk on the side of the road until you are at least 10-12 feet ahead of the bus. You should always be able to see the bus driver, and the bus driver should always be able to see you. For more information about the Caregiver Support or Grandparents Raising Grandchildren Program, or for further assistance with home and community-based long-term care options in your community, call the Area Agency on Aging District 7 Aging and Disability Resource Center Monday through Friday from 8 a.m. until 4:30 p.m. at 1-800-582-7277. A trained social worker or nurse is available to help connect you with resources that can assist you or someone you know with living safely and independently at home. Pamela K. Matura is executive director of the Area Agency on Aging District 7. For more information, call (800) 582-7277.